I love AVOCADO ~ from traditional guacamole, my succulent bisque, to straight up sliced avocado with lime, olive oil and salt over top. You can’t beat the health benefits ~ Enjoy! Place cubed avocado in blender with stock, cream, rum, powder of choice, salt & pepper. Blend until smooth & creamy. Garnish with dots of creme fraiche ~ slide narrow tip of wooden skewer through centers of dots to create a lovely pattern. 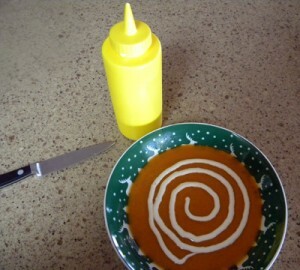 Alternately, place a spiral of creme fraiche, pulling the skewer through at regular intervals. place bisque in martini glass with a skewer filled with 2 grilled shrimp; place a dollop of creme fraiche or homemade pico in center. 3 thinly sliced slivers of avocado (sprinkle with lime to keep from turning), sprinkle with tarragon leaves. 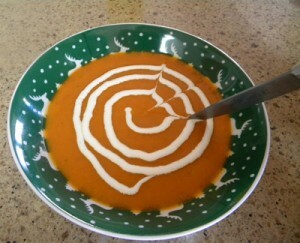 I found this great website: http://www.lespetitesgourmettes.com/recipes/soup-hits-the-spot-again/ showing how-to with creme fraiche ~ love it! This lovely red soup is perfect for Christmas or Valentine’s Day. It is decorated with crème fraîche. Crème fraîche is a thinner form of sour cream developed by the French. It has a slight tanginess because it contains bacterial cultures. But the amounts of cultures are far less than those in sour cream, so it has a smoother taste. One of the advantages of crème fraîche is that it doesn’t “break” as sour cream may when added to sauces. This is due to its higher fat content. Crème fraîche is becoming more and more available in stores, but is still just as easy to make at home. To do so; pour 1 cup heavy cream in a jar, add 1 tablespoon buttermilk, cover and shake. Leave covered, on the counter, in a room temperature draught-free place for 24 hours. It is ready when it is thick. Do not worry about the cream going bad, the benign live bacteria in the buttermilk will multiply and protect the cream from any harmful bacteria. After the 24 hour “counter time” place in the refrigerator. It will continue to thicken and take on a more tangy flavor as it ages. Crème fraîche will keep in the refrigerator for 7-10 days. Leeks are very dirty and must be washed well. Thinly cut of the root end off of each leek. Dice the white and light green parts of the leeks only, discard the dark green portions in the trash (not the garbage disposal, as they will clog it up – again, I know this from experience!). Place the diced leeks in a large bowl filled with cold water and swish to loosen and dislodge the grit, sand, and dirt from the leeks. Use your hands to lift out the leeks and place in a colander, run cold water over the leeks. Wash out the bowl and fill again with cold water, add leeks and swish again, strain into colander and drain. Heat the olive oil in a large soup pot, add the leeks and red peppers, sauté for about 5 minutes until peppers and leeks are soft. Stir in the garlic, rosemary, and oregano; cover and cook over low heat for 45 minutes. Remove lid and add beef broth, increase heat to medium high and simmer for 15 minutes. Using a slotted spoon, lift out the solids and place in a blender. Using a ladle, add a couple ladlefuls of the liquid and blend until smooth, return to soup pot with remaining liquid and stir to blend. Heat soup and taste for seasoning, adding salt and pepper as needed. Ladle soup into 8 soup bowls. 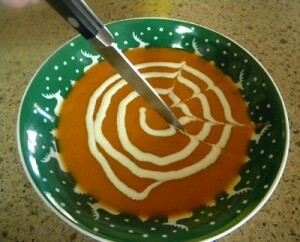 To decorated the soup, place the crème fraîche in a squeeze bottle and make a swirl pattern on top of each soup bowl. Using the tip of a paring knife, start in the center of the swirl and draw the knife through the crème fraîche through the edge of the swirl. Turn the knife around and start at the edge of the swirl and drag the tip of the knife to the center of the swirl. Continue around the bowl to create a spider-web design. To make little hearts in the soup, for Valentine’s Day; using the squeeze bottle filled with crème fraîche, make small dots around the edge of the bowl. Draw the sharp tip of a paring knife through each dot, creating the hearts.